i'm so excited for her to film new tv series!! and it's nice that she knows how we, the fans are feeling. Leila Tong started out as a child actor and has worked with several superstars when she was young, including Leslie Cheung and Stephen Chow. However, the most memorable collaboration for her was with former Beyond member Wong Ka Kui, who played her elder brother in a film. She frankly expressed back then she cried nonstop when she learned of Wong Ka Kui's passing. "When I was a child actor, I was fortunate to have collaborated with several superstars. The first was Leslie Cheung (Gor Gor), I was so nervous! Back then I was about 8 years old, it was in my first film Flaming Brothers, but I didn't see Gor Gor on the set, instead I bumped into him in the dubbing room. At the time, I just remember I was so nervous, my heart was pounding because it was my first time bumping into such a handsome Gor Gor. At the time my mother reminded me to take a photo with him, but because I was shy, I struggled for a long time before having the courage to walk up to him. Gor Gor very friendly and put his arm around me for the photo. But, there was one superstar in my heart, although he has passed away, I still cannot forget him even today, that person is Wong Ka Kui! Back then in Beyond's Diary, Wong played my elder brother and really cared for me. During that period, I really thought he was my actual brother! I remember the last day on the set, the scene was about our family immigrating, except for my brother, who was sick and couldn't come with us. He prepared a winter hat to keep me warm far in advance, but actually before shooting the scene scene, I already wanted to cry. Also with the accompanying lines, my tears just came flowing down naturally, I really was unwilling to part! For Wong Ka Kui, I made my first most daring move in my life, and that is to ask him for his phone number! I was even scared to just ask for a photo, so it's obvious asking for a phone number requires a lot of courage. However, I still took the courage and asked him. I carefully wrote it down too, of course I never had the courage to actually call him! After 2-3 years, I read the news about Wong's accident. At the time, I felt so shocked, and hoped for a miracle to happen every day. When Wong passed away, I saw the news before going to school and was very heartbroken. I was crying in school, I just couldn't accept his passing at such a young age! Initially I planned to attend his funeral, but because of some reasons, I didn't go. I believe that's good too because I didn't personally bid my final farewell to him, this way it feels like he never left. Back then, I did something really silly, I wrote a letter to Wong, but I really can't remember what I wrote. I just remember I secretly took the lighter and ran into the bathroom to burn the letter to Wong, hoping he would rest in peace!" I think this is new info for her new drama with CTI, can anyone translate? Edited by raymeila, 17 May 2012 - 10:49 PM. Haha thats a cute hair/wig! Wonder what the storyline is.. I'm already so excited to see it!! looks like she's the female lead! More info on Leila's police series with CTI called "Police Boundaries"
Ricky Wong held the blessing ceremony for CTI new series Police Boundaries (警界線). 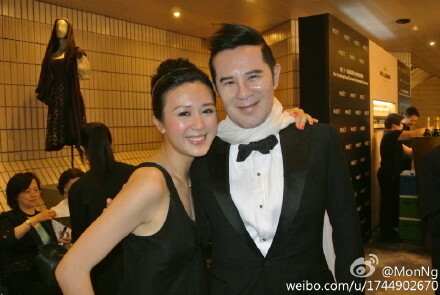 The cast including Liu Kai Chi, Dominic Lam, Lawrence Chow and Leila Tong attended. Ricky expressed CTI currently has enough series and variety shows in storage ready for CTI to begin operations next year, but he’s in no rush. Regarding to his confidence in obtaining the free-to-air TV license, Ricky expressed: “We can definitely start operating next year because each our productions are on a HK$20 million budget, so I am very confident.” It was rumored because the government keeps delaying the issue of the free-to-air TV license, iCable lost their exclusive rights to broadcast the London Olympics, which indirectly affects CTI’s license issue? Ricky told the media not to pull two unrelated things together, don’t make things that complicated. In the series, Liu Kai Chi plays a big thief and will have a lot of scenes opposite of Dominic and Lawrence Chow. He said the new working environment brings new light. 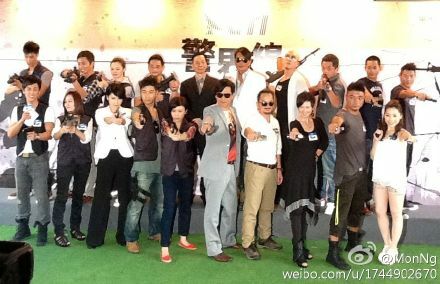 Before the series started, the cast and crew gathered to study the script together and took a course on gun shooting, which has never happened in TVB. Leila reveals she signed a two year contract with CTI and this is her second series with CTI. This is her first time playing a policewoman, she expressed the series is male-oriented, so she’ll have more time to look after her son. It looks like Leila is one of the big artists CTI is gonna be promoting first with Maggie Cheung and Frankie Lam too. I'm looking forward to her 2 new series!! After watching that video, I have faith in the new company that they will do well. CTI has released sales presentation for their upcoming series, Leila is in 2 of them! So excited that she's back these series look very very promising! Pretty mom Leila Tong is still very fit after childbirth. Her facial shape seems sharper, clearly giving her a more mature and feminine look. When asked whether caring for her son had been too difficult that she lost weight? She said: "When I'm not working, I stay with my son. I love playing with him, it's so much fun. I don't find it difficult at all." Leila's friends says she and her 2 year old little boy resemble more like an older sister and younger brother. Such a cute and heartwarming relationship. Also a dog lover, Leila has four dogs. She lives with her coffee-colored mongrel hence his name "Coffee", the other three dogs stay at her maternal home. Coffee is not only a playmate to Leila's son, but also his "big brother". Leila laughed: "My son calls him 'big brother' because Coffee is in fact older than him. Also we're just like a family." Recently, Leila has fallen in love with yoga, she expressed exercising can get tiring, but it can relax one's mind and be a stress reliever. She said: "Yoga made my mind a lot more peaceful and can help regulate stress in my everyday life, so I will continue with this exercise." Leila Tong revealed that she is happy working with Ricky Wong's HKTV despite the fact that the station still having difficulties obtaining a free-to-air TV license from the Hong Kong government. According to Popular Asians, at a Buddhism seminar at the Hong Kong Coliseum recently, the actress said that HKTV has given her a lot of freedom in her work, thus, she has no regrets signing with them. The former TVB actress signed with HKTV last year, and had filmed two HKTV dramas back to back, which are "Marvel Century" and "Police Boundaries". "Police Boundaries" recently had a five-minute preview on YouTube and Facebook – a marketing strategy used by the station due to Hong Kong's government delayed approval. The actress clarified, "Many friends are sharing the clips, and I also shared the videos on Facebook. I hope that this will convince the government to pass out the free license. I will be shooting my third drama [with HKTV] soon. As long as I find the drama suitable, I will film it. [HKTV] has a lot of freedom." 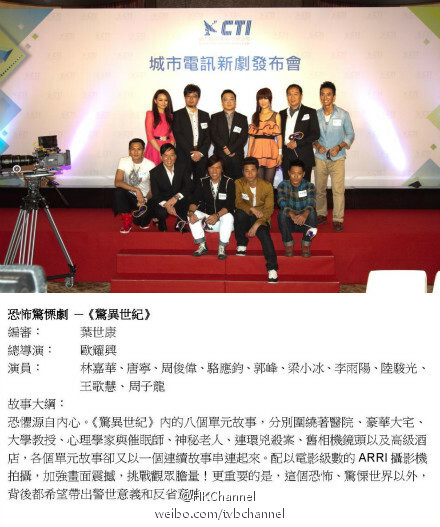 Meanwhile, Leila reportedly will film HKTV's grand opening drama, "Flow Of The Years" soon. The drama also stars Felix Wong, Ha Yu and Paw Hee Ching. Miss her so much! (: Def. gonna watch all her series in HKTV, once they get their license! Ron&Leila is one of my favorite pairings from TVB' sad that we might never see that pairing again but glad that she will be given more chances in HKTV!! & After watching Police Boundaries, I'm soooo excited for it! I think the new series has Jessica Hsuan too! I didn't know she signed with HKTV too. It's so dead in here I miss Leila's tv series. Hong Kong actress Leila Tong recently revealed that she is currently five months pregnant. As reported on Mingpao News, the actress, who was in Happy Valley to shoot her upcoming series, stated that she has yet to experience any discomfort during work despite her growing belly. "I am comfortable carrying this baby to work. My manager is even more worried than me," said Leila. "When I walk fast, she tells me to go slow. But I don't feel anything and I don't feel the need to be accommodated." This will be the second baby for Leila, who married director Desmond Tang in 2010 after meeting for the first time while working on the stage play "Popcorn Killer". Their first child, a son, was born back in March 2011. Leila Tong (唐寧) recently gave birth to a baby girl. Indeed, already has a son and now a daughter, Leila has completed the combination of the word 'good' (好). When she first gave birth to her son, she had underwent a caesarean section. This time she wanted natural birth, but her doctor recommended a caesarean section and gave birth to a healthy baby girl weighing 7 pounds. Leila has now returned home to rest and insisted she will breastfeed. aww congrats to leila so cute now she has a girl!! Edited by LeilaTong4Ever, 09 February 2015 - 03:56 AM. Leila Tong (唐寧) was 9 years old and a child artiste when participated in the series, The Greed of Man (大時代), and acted as Damian Lau's (劉松仁) daughter. She accepted an interview from ON.CC (東網) and expressed she did not really understand about the script, and did not really watch the series for almost 20 years. Leila hoped to grab the opportunity to watch the repeated telecast and said: "I watched the first episode and many children 'cap' seat for me to watch." Four days ago, love ambassador Jessica Hsuan (宣萱) and Leila Tong (唐寧) attended an event related to genetic cancer in Times Square shopping mall. Jessica expressed she had a fixed check-up for ovarian and breast as health was very important. Many ladies were afraid to face this problem but it was best to go for check-up earlier and precaution. Jessica was also the spokesperson for beauty salon and disclosed she maintained her anti-aging routine. When asked if she will consider plastic surgery, Jessica replied confidently: "No need for the time being but never say never. Perhaps after 10 years." As for Leila, she focused on her health after becoming a mother of two children and will accompany them longer after having a better health. She revealed she was currently exercising and needed to lose another 7 to 8 pounds in order to regain her previous body figure. When mentioned about Mother's Day was approaching, Leila replied she will be celebrating with her mother: "My elder son is 4 years old and my daughter is 4 months old. I realise mother is noble after becoming a mum and will cook something for my mother when returning home." Louis Cheung and Leila Tong collaborates once again after twenty years! Louis Cheung (張繼聰) and Leila Tong (唐寧) began their career as child actors. Having collaborated when they were young, they are acting together once again 22 years later. This morning, Louis shared on Instagram two photos of him and Leila, with director Patrick Kong (葉念琛) in one of them. Louis wrote: "Thank you Director Kong for inviting me to participate in his new work! Working with Leila once again after twenty years!" Many netizens expressed their anticipation towards Louis and Leila's collaboration and also praised that there weren't much changes from when they're young. There was also a netizen that left a message joking that their new work is the sequel to "CYC Family" (CYC家族), which was the series they've worked together in. Louis and Leila filmed Hong Kong series "CYC Family" in 1993; actors who were also in the series were Bryan Leung (梁家仁), Idy Chan (陳玉蓮), Sam Wong (黃寶龍) (child star who played the younger version of Sean Lau's Fong Chin-Bok (方展博) in The Greed of Man), child actor Jacky Cheng (鄭柏林), and others. Artiste Leila Tong (唐寧) attended an event and expressed her son was studying K2 and wished to return to school during summer holidays: "He is very happy when studying K1. A student keeps shouting for 6 months since school starts." She pointed her son started to learn on how to take care of his sister: "He always fights for preparing milk powder and I tell him to let me do it first." Leila added her son and other classmates learned to draw: "They are always together and very warm." Nice to see Leila doing films again! Actress Leila Tong (唐寧) attended Christmas event in Sheung Wan and when mentioned about exhibiting 50 crystal balls during the event, she replied she had been collecting crystal balls since small and had nearly 100 crystal balls now. Leila said: "I have to put some at my manager company as too many. Some are given by friends, fans and family." However, her husband did not give her any special crystal ball as they had passed that stage: "I must leave some quota to the children for collection." Leila disclosed she had set up an online shop to sell environmental friendly products lately and it included handicraft items: "I know many instructors who are good at making handicraft items. (Fall sick as too busy?) Infected by my son." She added her son recovered after one or two days but she had not recovered after several weeks. Artiste, Leila Tong (唐寧) attended charity event and expressed her desire to bring her son along but needed to wait for him to grow older. She will also show the photos to her son after every visit: "He is very emotional and will shout. I will show him happy photos and tell him the water over there is different from here." Leila taught environment protection to him as well. Actress Leila Tong (唐寧) attended Leslie Cheung's (張國榮) class movie event and disclosed she acted as a child star in Leslie's film, Once a Thief (縱橫四海) and The Bride with White Hair (白髮魔女傳). Leila acted as the young Cherie Chung (鍾楚紅) in Once a Thief movie and the young Leslie in The Bride with White Hair. Thus, she had no chance to film with Leslie but finally got to meet him during a dubbing session of The Bride with White Hair movie. At that point, Leslie told Leila: "You are the one acting as the young me." Lelia's mother then urged her to take photo with Leslie and it became a precious photo. I hope she returns to film or tv soon. Miss her on the screens! You know how they've turned return to the cuckoo and triumph in the skies into films?, I kind of wish they would do one for the last breakthrough! That would be really interesting and it seems like she has a better relationship with the film industry too. Actress Leila Tong (唐寧) attended an event related to survival and expressed she will be returning home to accompany her family after that. She might take advantage of the recent good weather to bring her family for hiking. As Leila is busy taking care of her family, she has no plans to film series now: "Really want to film series but my 1 year old daughter is still small while my son will be studying primary 1 soon. Hence, I must spend more time with them. (Any free time to spend two person world?) We have the responsibility to take care of our children but I wish to go overseas for vacation and travel to Taiwan for few days earlier. Thus, I leave my children to my parent. I did not plan the itinerary and get to know other people. I also ride bicycle for 2 hours and it is a happy travelling experience." Leila Tong is training her son to become small god of culinary? Actress Leila Tong (唐寧) attended an event related to Macau's small god of culinary in Tsim Sha Tsui and disclosed she brought her 5 years old son to attend the training session of 2 days 1 night of small god of culinary. She said: "We went to Singapore earlier and it is second time this time." Leila added her son was mischievous and when asked if her son will follow her to the market, she said: "I will go there alone if want to be quicker. In fact, I need to bring him along so he knows the ingredients as it is different after cooking. (Will be playful at the market?) He is growing up and better now." 35 years old Leila Tong (唐寧) joins the showbiz as a child star and her divorce news was exposed on 07 June. She is married to Desmond Tang (鄧偉傑) who is older than her by 13 years old in 2010 and it turns out that they are separated last year and divorced this year. Leila's manager, Ms Wu announced the news on social networking website on 07 June: "When I know Leila has some changes in her married life, she is separated from her husband last year and divorced this year, I feel it is a pity but life still has to move on and we must face it bravely. Although her son and daughter will follow the mother, but both parties promise to support them together. Hopefully everyone will give them their supports and give them time to handle their matter. Over here, I give my blessings." However, the main parties have yet to response and accept any interview. Wowww haven’t been here in ages! I hope Leila is doing well after her divorce . I wish her and her 2 kids all the best! Hope she’ll continue acting miss her!